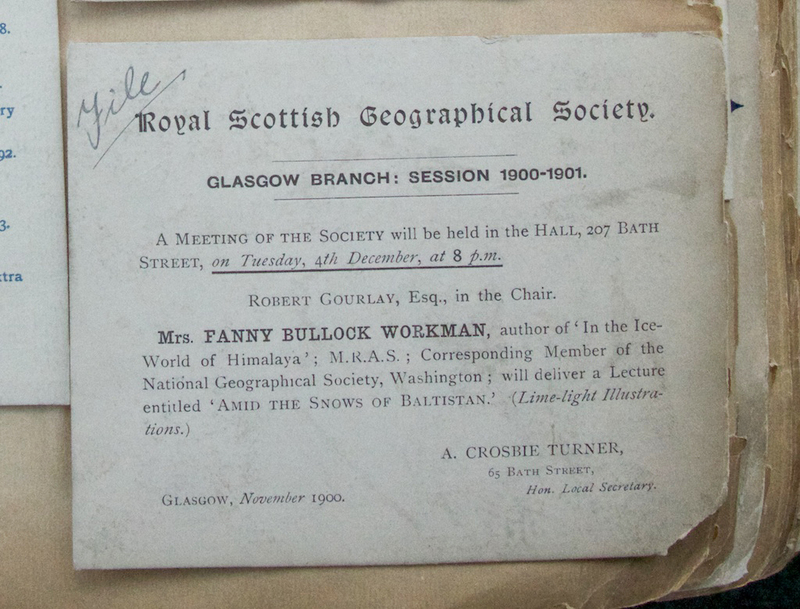 Recently I’ve been coming across newspaper cuttings about Fanny Bullock Workman, a guest lecturer at the Royal Scottish Geographical Society and a remarkable woman by all accounts. I was intrigued by the presence of a supporter at her lectures, one who was obviously content with taking a back seat and a comparatively minor share of the limelight: Dr William Hunter Workman, her husband. In view of the fact that Fanny’s lectures took place in 1900, when women were still expected to conform with oppressive Victorian expectations, this seemed highly unusual. 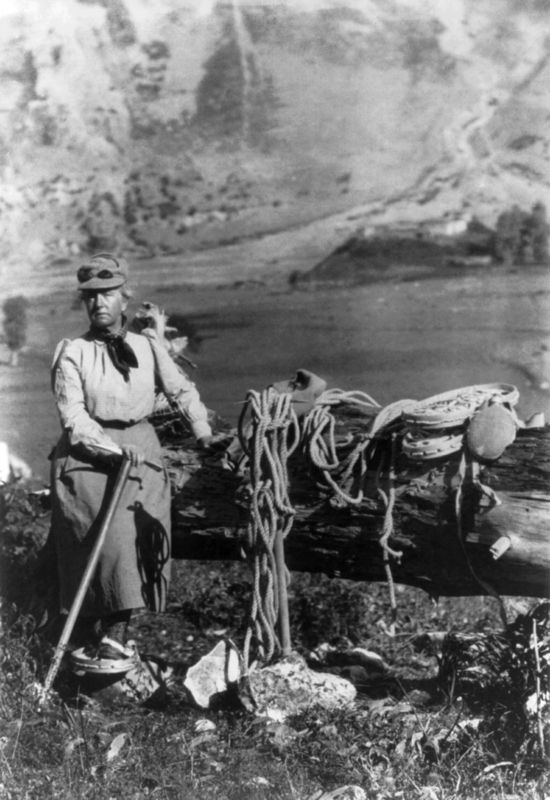 Then I noticed that she had just climbed a mountain of 21,000 feet, a world record for a female climber at that time. What an astonishing achievement. Fanny was obviously a woman to be reckoned with. One of my first reactions was to Google an image of her. 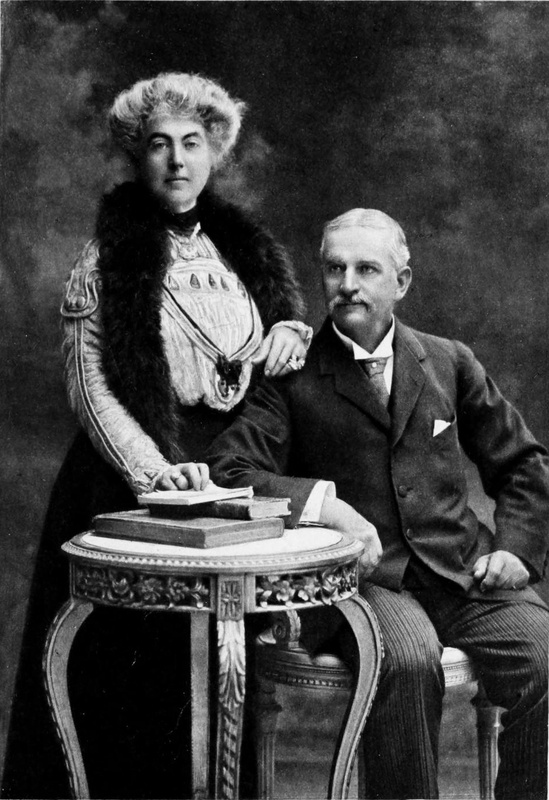 Up came a delightful black-and-white photo, obviously a studio portrait, of an expensively-dressed woman with strong dark brows and exuberant hair done up bouffant-style, with one hand resting lightly on the shoulder of her seated husband. Fanny looks young, fresh-skinned and composed, but there’s something about her face – a kind of immutable determination. Suddenly, you can begin to see her climbing mountains. William, on the other hand, seems quite a bit older, his hair grey and thinning, but there’s nothing in his expression to make you think that his energy is being drained away. These two must have an interesting dynamic. Fanny Bullock Workman was born in 1859 in Worcester, Massachusetts. She was the daughter of a state governor, and her family’s considerable wealth guaranteed her a privileged education. As a young woman she was sent to a finishing school in New York before travelling to Paris and Dresden to refine her French and German. When she returned to the US, she married a successful physician 12 years her senior; together they went climbing in the mountains of New Hampshire, developing some serious skills and joining climbing clubs that, unlike most of their European counterparts, admitted women as well as men. Having reached the summit of Mount Washington, Fanny set her sights on new challenges. She was still in her twenties, energetic and ambitious; by contrast, William was suffering from the stress of over-work, and in 1889 he opted for early retirement. They had a four-year-old daughter, and the rest of Fanny’s life must have looked worryingly comfortable and suburban. A complete change was in order. Dr Workman might have been planning on showing his prize dahlias and putting in a row of onions, but he was going to have to think again. With their finances boosted by the inherited estates of their respective parents, Fanny and William moved to Dresden. As if by magic, Dr Workman’s health recovered with the change of scene, and the couple started to look around them for adventure. 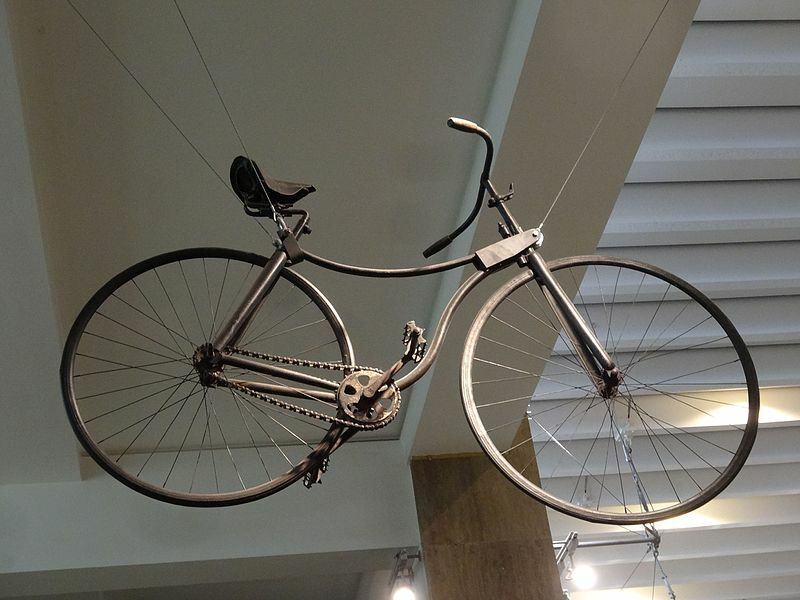 It came from an unusual source: the newly-patented ‘Rover’ safety bicycle was taking Europe by storm, its two identically-sized wheels giving it huge advantages over the preposterous penny-farthing. Added to this, the revolutionary design meant that riders could actually put their feet on the ground when they stopped, which must have been an enormous relief. Fanny and William bought one each. With them, they planned to boldly go where no cyclist had gone before. In 1895, carrying 20 pounds of luggage apiece, and leaving their daughter in the care of nursemaids, Fanny and William set off across Spain. They travelled 2,800 miles, and covered an average distance of 45 miles per day. The journey was not without incident, partly because their bicycles were objects of immense curiosity. On one occasion, having locked them up downstairs and gone to bed in their lodgings, they were awoken by a terrific din that was caused by all the villagers who had broken in and were squabbling over who should try them first. In the morning, the handlebar of one cycle was found to be twisted and the brake was damaged. Fanny was not best pleased. 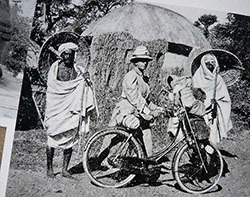 Afterwards the Workmans co-authored a book called ‘Sketches Awheel in Modern Iberia’, which set the tone for future journeys: together, they would ride across Algeria, Italy and India, recording their observations in words and photographs and offering lectures to institutions all over Europe. Fanny climbed Mont Blanc and the Matterhorn, providing indisputable proof that a woman could tackle the highest Alpine peaks. It was only a matter of time before she clapped eyes on the Himalayas, and the revelation came when the Workmans were travelling through India in 1897. Driven up into the cool foothills by the intense summer heat, Fanny caught a glimpse of the distant summits, glistening and pristine and beckoning, and in that same second she wanted to climb them. It was a game-changing moment, but the Workmans were nothing if not resourceful. They abandoned their bicycles and hired a Swiss mountain guide: Matthias Zurbriggen, one of the most talented of his profession. If someone had explained to Fanny about altitude sickness and all the other pitfalls of Himalayan mountaineering, she might have listened politely but you wonder whether she would have paid much attention. As it was, nothing much was known in the late 1800s about the effects of oxygen starvation or frostbite, and Fanny, clad in thick serviceable skirts and hob-nailed boots, was not to be trifled with. In the company of her equally dauntless husband, she was already picturing herself triumphantly on the crest of successive unknown peaks. Fanny’s revelations about her expedition were enough to raise the hairs on most of her listeners’ elegantly-hatted heads. She was no drama queen, however, and appeared to take every obstacle in her stride. Accompanied by 50 servants and porters, the Workmans had been obliged to ford the Askor torrent 12 times as they followed their route upwards, before reaching the pass of Skoro La at 17,000 feet. A flimsy rope bridge across the Braldu river, spanning a gaping chasm of 270 feet, Fanny described simply as “one of the longest and most trying in the country”; and when she and William finally reached the Skoro La and were advised that it was too early in the year to cross it, they resolved to “open the pass for the season”, as if it was a mere formality that was just awaiting the arrival of the appropriate dignitaries. Fanny’s presentations were accompanied by limelight views, still a relatively new feature of RSGS lectures, and the Aberdeen Journal gave careful credit to the lantern operator whose job it was to set fire to a pellet of lime placed in a specially-designed lantern. Once it was alight, the flame was intensified with the careful addition of bottled oxygen and hydrogen, and the resulting glow was used to illuminate the slides. One of the interesting things about Fanny was her apparent immunity to altitude sickness. She climbed at a slow pace, requiring many overnight camps, and her leisurely progress must have allowed her to acclimatise gradually to the increasing height. In this way, her physical limitations gave her a huge advantage. Nor did she care about the squalor of the accommodation which she was frequently compelled to endure. The things that really annoyed her were incompetence and laziness, and her reprimands often invoked terror among the unwary porters. Some of them ran away. The Workmans made eight expeditions to the Himalayas over a period of 14 years, and were only prevented from continuing by the outbreak of the First World War, when the much-disputed regions of Central Asia were apparently too dangerous even for Fanny to countenance. Had she done so, however, and had the Workmans braved the Pamirs and the Karakoram Pass with their customary sangfroid and terrifying organisational capacity, there is no telling how much sooner the war might have ended. In her reports and lectures Fanny seems to be quite a detached observer, describing the people and the landscapes in the professional manner of a surveyor rather than with the emotional response of a travel writer. This is a reflection of the Workmans’ attitude to exploration as a whole: they held themselves apart from local people, and did not generally immerse themselves in traditional culture and customs. They were prepared to pay for legions of porters, and on many occasions they were forced to pay generously in order to persuade men to go where their better instincts told them they should not – largely through self-preservation; but there isn’t a great deal of empathy in their writing. There was one subject, however, which roused Fanny to full-blown anger, and that was the issue of women’s rights. Women, she believed, were just as capable as men, and she had proved it by shattering the male exclusivity of Himalayan climbing. Whenever she saw women being suppressed or abused, she spoke out and demanded justice. 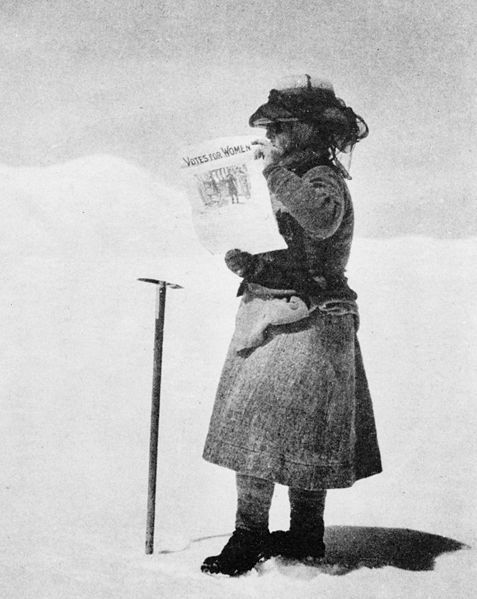 Women’s suffrage was a cause that she took to her heart, and in 1912 she was photographed on the Siachen Glacier in the Karakoram, holding a newspaper with the headline ‘VOTES FOR WOMEN’. This simple but brilliant piece of publicity was flashed around the world – relatively speaking – giving a clear message to women everywhere, and bringing the issue to the forefront of public awareness. Politicians would soon come to regret their dismissal of suffragettes as attention-seeking extremists with a taste for melodrama. As for Fanny, she left them in no doubt of her own sentiments. Most of the women explorers I’ve encountered so far have been wayward and fairly solitary by nature, led by their heart, making decisions based on instinct rather than intention. They see danger and they go there, wantonly, revelling in the risk and usually coming out unscathed. Fanny is slightly different. She doesn’t appear to appreciate the danger at all, because she gives very little time to it in her mind. Instead, she sees an ambition and works out a way to fulfil it through meticulous planning, like an experienced army general contemplating a large-scale military manoeuvre. What lies beneath the surface may be a sense of close-guarded vulnerability: as a mother, she could never be accused of being over-protective, as she was absent for long periods in her daughter’s childhood; and her lost her second child, Siegfried, while he was still an infant. Her emotions must have been kept private, but found escape in other ways, and in support of other things: certainly her relationship with William must have been built on a strong foundation, as the two seem to have enjoyed their combined career as explorers and writers, viewing the world from a similar standpoint and offering each other constant and steadfast support. Forceful and commanding she might have been, but you have to admire Fanny for the qualities that brought her an extraordinary degree of success. She doesn’t seem to have known a moment’s self-doubt, and she rose to prominence as a respected explorer, writer and lecturer with an assurance that was way ahead of her time. When John Clarke of Aberdeen University gave Fanny a vote of thanks after her lecture, he expressed admiration not just for her formidable achievements but also for her recent tour of Europe, during which she delivered talks fluently in both French and German. Fanny received France’s highest literary title – Officer de L’Instruction Publique – and she was the first American woman to lecture at the Sorbonne in Paris. Honours from academic societies were showered upon her. 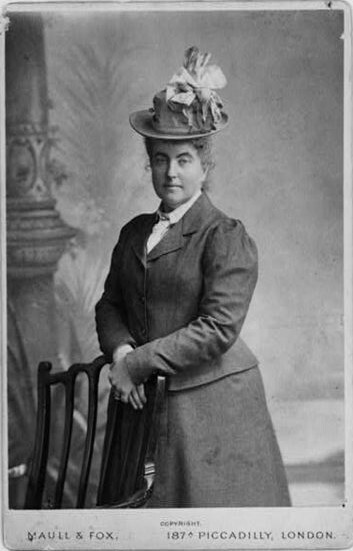 Among them was the Fellowship of the Royal Scottish Geographical Society, awarded in 1898, making her the Society’s second female Fellow after Isabella Bird. Fanny died in 1925, aged 66; surprisingly, William outlived her, and passed away in 1937 at the age of 90. Their daughter, Rachel, married a wealthy Scotsman who later became a baronet, giving her the title of Lady Rachel Workman MacRobert. She continued her mother’s strong-minded support of women’s rights and also became a specialist in geology, studying in London, Edinburgh and Sweden. Fanny is one of the remarkable explorers included in my book, ‘The Great Horizon’ (Sandstone Press). If you’d like to read about some more inspiring women explorers, take a look at my posts on Freya Stark, Isabella Bird, and Isobel Wylie Hutchison. Wow!! What a woman. Great story Jo. A strong minded individual, for sure. I like the idea that pacing herself may have helped her accomplish more. And you’re writing a book? Brava! I will be looking forward to that. Another remarkable explorer beautifully described, and interesting that you note the differences in attitude between her and some of the other ladies you’ve researched. I love the photos, especially that one of her holding the newspaper. Your book is sure to be a cracking read, do you have any more information about it yet? That’s quite an undertaking, 50 different explorers. I’m looking forward to hearing more about it.